Patience is a hard thing to acquire. We live in a world where things come quickly. Food, information and even transportation is available without any wait. But, there will be things in life that require patience. And when these things come along, it doesn't matter if you can sit and wait for days, your attitude is what truly makes the difference. 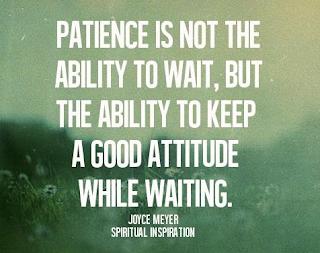 Having a good attitude while waiting is a trait that not many people have, but it is something that is vital for maintaining happiness and joy.